Sold out. Two words I didn't think would come out of my mouth the moment I decided to pursue this crazy idea of creating my own line. I spent (in every sense of the word) my ALL to make this collection happen - from experimenting with fonts, playing around with dozens of design possibilities, searching for the right companies, getting back-and-forth approvals, talking with models, building the store itself - with no assurance that every penny and ounce of energy was worth anything to anyone. And for months of careful planning and studying up to the day that I cried upon receiving the final, perfected samples, I only really did hope for it to be at least worth your time. You may note that everything I say from this point forward, I was too chicken to say out loud for the campaign video or launch vlog, which, contains only half the truth of what the brand means to me as a girl that's just trying to be successful on her own terms. The truth is, ever since I quit being a host/whatever else I was at U Do U and Afterparty, I only wanted to spend all my energy creating original content that could crack a smile or inspire a good day or year in anyone living on this planet, without a middle entity to tell me what I can or can't say, or do. For too long, I've been either too afraid or hesitant to answer when someone would ask, but that's all I want to be, really - a living reminder that it can all be so good. From solely living off of freelancing as a host/model/filmmaker/photographer/event partner/whatever-odd-job I could find, starting up a business was a huge risk in which the career I'm trying to build for myself literally depended on. 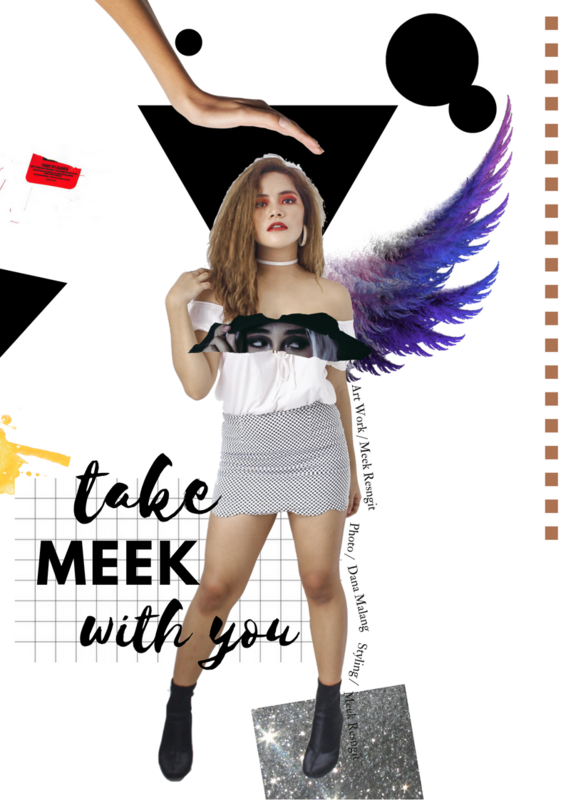 But Shop Meek was all the risk I was willing to take to prove to my parents, my old boss, and ultimately, myself, that I could get by without the desk job that everyone seems to be so obsessed for me to have. And that's what I mean when I say thank you for allowing me another chance to do what I love and in turn, helping me take a step closer to my dreams with your purchase. If you please, I would like to thank Dana Malang for hearing me out and helping me make my vision for this brand come to life, Daniel Tan and Gabriel Garcia for the counsel and moral support, Ralf Lagleva for helping out with the video, the models for representing my brand, my sister for talking me up when my mom (and myself) would doubt what I was trying to achieve, and Ru, the new dog in the family, for comforting me when the night was emotional. Lastly, I want to thank YOU for helping me believe in my shot at growing my YouTube career and that I'm not at all complete trash. I hope you can keep supporting Shop Meek (and funding my videos along with it) because, believe me, you've only seen the first of what's to come. Telling my story through clothing has been quite a learning experience for me this year, so I'm really glad I got to share and express that with you right before I turned 21. Until the next batch, you stay gucci, my little pineapplehead. Thanks for taking me with you.